This yard debris cart, though overflowing, won’t be emptied for another week. The question of starting weekly collections of yard waste will come up before the Albany City Council again this month. We’ll see whether carts overflowing with springtime clippings and storm debris prompt a different outcome now. Last October, the council turned down, by a vote of 5-1, a proposal by Republic Services to pick up yard debris weekly instead of every other week, as it does in Albany now. The company wanted to add the service and charge $3 more per month. The council majority decided the added fee wasn’t worth it to customers who didn’t need the extra service. But last month, Councilman Mike Sykes, serving his first term after being elected in November, asked for the issue to be revisited. In response, Republic plans to present a new proposal when the council meets for a work session on May 22. Julie Jackson of Republic Services tells me the monthly fee increase for the weekly pickup this time would likely be more than the $3 proposed last year. The amount will be worked out by the time the council meets. The company had extra capacity last fall and now it doesn’t, she says, and providing weekly pickup will require buying a truck and hiring another driver. The extra charge, though, she adds, will be far less than the $9 a month already being paid by about 600 Republic customers in Albany for weekly pickups available as an option. Republic provides weekly yard debris pickup for all its customers in Lebanon and Corvallis, along with its routine collections of trash and commingled waste for recycling. This allows food scraps to be added to the yard debris, which in turn allows some customers to reduce the size — and thus the fee — of their carts for trash. Hering always buries a gem of a one-liner at the end of his column. The premise of this sentence requires that one must have trees on one’s property. For those of us who do not, weekly yard waste is weekly money waste. To voluntarily submit to a 12-month price increase on a long shot bet that weekly service might make users possibly fill their carts with leaves that fall through perhaps a 2-month period annually, is utter nonsense. Republic moaning about their cost increases defies credibility. Republic was the entity floating the idea in the first place. No secret here…more pick-up means higher rates. The last question then is, why does Councilor Sykes want to “revisit the issue” when it was beat down soundly by a 5-1 vote just 30-days before he assumed the throne. Is he simply feeling his way around, or is there some other reason why he might wish this rate increase to go through? Sykes is new, but someone should take him to the side and explain things to him. Perhaps Kellum could handle that. In the meantime, weekly service for those who want it is available. Let the User-Fee concept prevail. Besides, if Albany had weekly yard waste pick-up and if magically, the citizens of Albany were to rake up the leaves and plop them in their Republic Receptacle, then what need would Albany have for those massive and quite effective Street Sweeper Machines and what need for the City Employee paid to drive said machine. A better solution would be to invest in Autonomous Street Sweeping Machines. Unleash these non-union, “never-get-tired” machines that don’t need a day off and then encourage folks to toss all their yard waste into the street. Think of the money Albanians would save. maybe if Republic did a better job of leaf pick up, leaves wouldn’t be washing into the storm sewers. I had ZERO leaves in front of my house until Republic moved some there from 1/2 block away with their sloppy technique. Weekly pick up would mean nearly 40 more UNNEEDED “truck trips” past my house each year. Why put up with the noise & diesel fumes for NOTHING? If you have too many leaves etc., buy a shredder. It’ll reduce the volume to about 1/6. What is the benefit to weekly collection? To me, there is very little. I don’t put out my yard debris cart from Dec. thru March at all. And I already use the smallest garbage can option. This articles speaks to the growing problem of commingled recycling and how often non-recyclables end up mixed in, reducing the value of recycled materials due to extra sorting costs. It will be more than the additional $3 per month…now! Isn’t that just like a corporation. 5-1 vote in opposition last time. I suggest 6-0 in opposition this go around. It’s my understanding the yard waste is recycled into compost? How can rotting meat make good, HEALTHY compost? Wouldn’t there be a danger of deadly pathogens to the end users of such product? This article explains it really well. No, I don’t believe we should have mandatory weekly yard debris pick-ups. If you want more than that, pay for that extra service yourself or just get 2 yard carts. You’ll pay extra either way. Why should those of us who don’t use yard debris carts have our rates go up by anything because a small few want weekly pick-ups? If it’s an issue of wanting weekly yard pick-ups just so you can mix food waste into your yard bin- maybe you need to reevaluate your food waste itself? If you have that much, why? That’s just $$ wasted as well. My house has one of Republic’s small garbage cans. We rarely even fill it halfway weekly. Our recycle bin is always full though. It would be nice to have an option of bi-weekly garbage pick-ups. Nope, they won’t offer that though. You’d think they would consider it. Imagine how much gas it would save their trucks and money overall on wasted stops for half empty cans. I do wish it were optional, just as I wish a biweekly garbage pick up were optional as well. None of my cans are ever full at pickup. You CAN put your food waste in your yard cart if you want to. Our yard waste goes to the exact same place that Corvallis residents’ combined yard/ food waste goes. I’ve been putting food scraps in my yard cart for years, minus animal byproducts. Color coding the carts would solve any pickup errors if that’s why Republic won’t consider offering different kinds of options. No more added fees for services not needed or wanted, please. I already had a shock being charged for storm drains which I do not have. 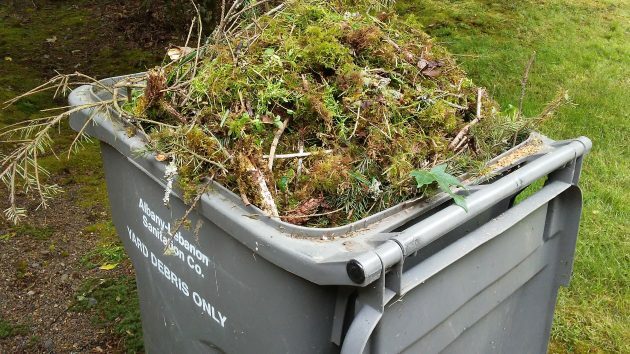 Show people how to compost if someone thinks they need more yard debris pickups. Ha ha. That practice is about as likely as training people to put leaves in yard debris carts. Again, no storm drains here. Let those who want it pay for it. Those of us who don’t should not have to pay for those who do. *raises hands over head and claps* A first! (There may be more.) TC & I agree. Absolutely! This corporate & council con job should not be forced upon us. I don’t want to pay for “more” yard waste pick up that I do not use now. Yard pickup is simple economics. It’s not in the self -accelerating category of insurance (whether auto or medical). I remember the sales pitch for required auto insurance — ‘rates will go down because more will be paying into the program’. Well, having more money available raised price of repair as well as liability settlements. The cost of health care ballooned for much the same reason. More money available funded better equipment and techniques, which in turn cost more to execute; while the cost of malpractice coverage ramped as well. I know this is offtopic, but felt the need to point out the difference between a deminimis problem and a big danged deal.